13x Cleaner Than a 20 kW Generator - Gridless Power Batteries - Gridless Power Off-grid, clean, rugged solutions for your toughest power problems. Gridless designs solar batteries with the capacity of a generator. 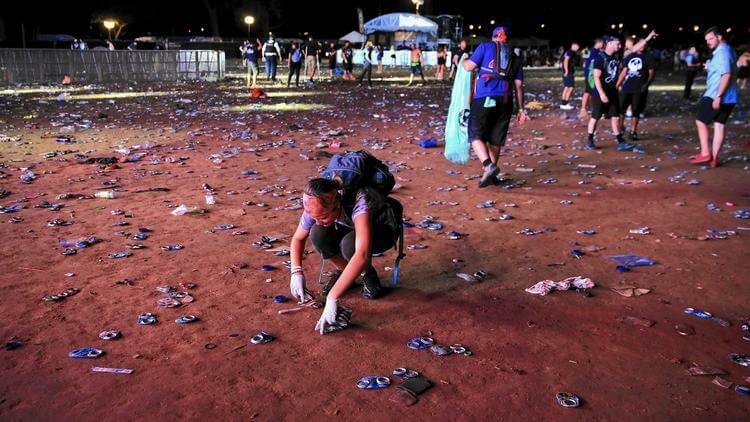 We don’t have to tell you that waste management is a growing concern in the events industry. According to the Chicago Tribune, 2010’s Lollapalooza music festival generated 177 tons of trash and only 25% of it was recycled . However, events create an even more dangerous form of pollution that you can’t see. Air pollution. Until the release of the Gridless Power 7000, the go-to power source for portable event power was the diesel generator. However, diesel is a dirty fuel that creates emissions that harm both humans and the environment. According to the Energy Information Administration of the United States of America, when burned a gallon of diesel creates 22.4lbs of CO2 . Batteries don’t generate power and therefore do not pollute. However, they have to charge somehow which means they are as environmentally damaging as their power source. Obviously, if you charge a Gridless unit from the sun there are zero emissions. That is right! Zero, zip, nada. However, if you are charging it from a wall, there will be emissions created from the electricity generation. Pollution from electricity generation primarily depends on where you live and how your state generates power. For this comparison, we will use the state of Pennsylvania. Below is a breakdown of Pennsylvania’s power generation using data taken from U.S. Energy Information Administration . As you can see, it is pretty heavily split between nuclear and combustion based energy creation. So, to create 1 kWh of energy the state of Pennsylvania emits 0.87 lbs of CO2. The average mid-sized concert uses 1 kWh of energy per hour based on research that you can find in our case study here. Therefore, a Gridless unit charged from the wall is responsible for 0.87 lbs of CO2 per hour during a concert or festival. However, in order to be able to compare a diesel generator to a Gridless battery, we need to do some quick math. Live sound systems rely on a generators ability to peak very high in power and dip back down again as the intensity of the music changes. Therefore, often times you will see a 20 kW generator used at way less than its capacity. After doing some research online and speaking with the third largest equipment rental company in the United States we found that a 20kW generator uses between 0.6 and 1 gallon of fuel per hour of use . However, this is difficult to estimate due to various conditions such as temperature, altitude, fuel additives, and load. To be conservative, we will go with 0.5 gallons/hour for this example. Knowing that 1 gallon of diesel emits 22.4 lbs of CO2 when burned, we can assume that in a single hour it generates 11.2 lbs of CO2. Therefore, Gridless batteries emit 13x less CO2 than a traditional 20 kW generator. Using the value of 11.2 lbs of CO2 per hour for a diesel generator and 0.87 lbs of CO2 per hour for a Gridless battery we can look at the environmental impact of a town concert. The diesel generator creates 134.4 lbs of CO2 or about the weight of a baby giraffe . The wall powered Gridless unit creates only 10.44 lbs which is over 13x less pollution! Furthermore, if you charged the whole unit on solar, then it would be infinitely better because solar panels create 0 emissions. Outside of the positives to your health and the environment, it is about ⅓ the cost of a generator. In the table below you can see that using 2 Gridless 7000’s for your concert is significantly cheaper because you no longer need fuel or permits. The numbers speak for themselves, it is better for your health, the environment, and your wallet. Using flexible charging options such as solar, wall and vehicle charging, Gridless Batteries are ready to help you reduce your event, concert, or festival’s impact on the environment. Want to have your concert or festival go green? Get in contact with us today.